In this age of technology, Emails have been a very essential communication media. Be it for personal use or for any organizational purpose, emails have become an important part of our everyday life. In business, communication is an essential factor for successful planning and execution of events. Moreover, all most all financial and other aspects of the business are discussed through email transactions. Hence, all the mails in your MS Outlook/Outlook Express/Windows Mail account are extremely important and you can not afford to loose them. However, you can not completely put aside the facts of accidental mail deletion, mail account deletion, server database corruption etc., which lead to the loss of your precious mails. Therefore, in order to overcome such situations, you need to keep backup copies of your valuable email accounts. In case of any problem, these backup files of your emails will help restoring the lost emails and other mail components back, so that you can carry out your regular tasks smoothly, without any time delay. Backs up everything : Takes backup of all your Emails, Contacts, Calendar Entries, Notes, Tasks etc. Backs up data to any location : Take backup to any Local, External or Network connected drive. Protects Backup file with password : Provides option to set password on the backup file. Allows selective restoration of emails : Allows restoring individual emails along with complete restoration of mail account. Compatible with all major Windows Email Clients : Works on MS Outlook / Outlook Express 2013, 2010, 2007, 2002 and Windows Mail. Run Stellar Mail Backup utility. 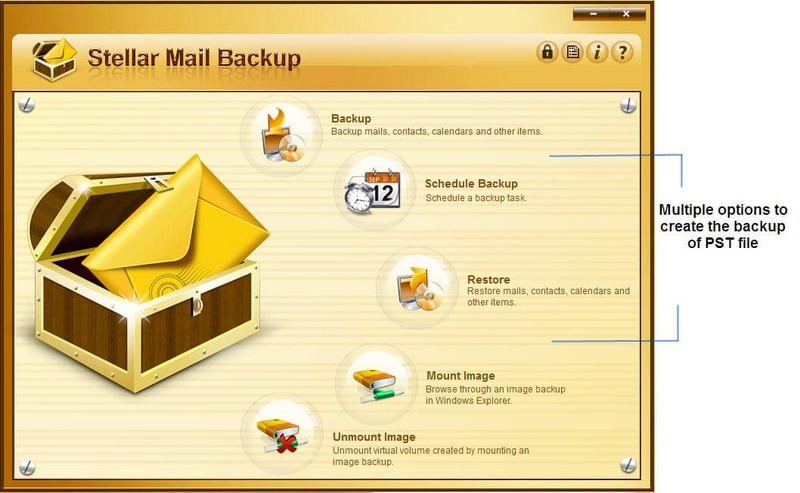 The home screen opens with the options – 'Backup', 'Schedule Backup', 'Restore', 'Mount Image' and 'Unmount Image'. Click the 'Backup' icon. A message window opens. Click 'Next' to continue. 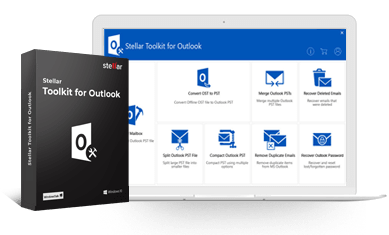 The software search for all the email clients (MS Outlook/Outlook Express/Windows Mail) configured in the system and lists them along with their corresponding mailboxes. Check mark the email client, and the email account that you want to backup. Browse and select the destination location, at which you want to save the mail backup file. The destination path of the drive will be displayed in the 'Destination Path' box at the bottom right corner of the window. Click 'Next' to continue. Another window opens. Provide a name to the backup file and the backup task. By default, the software gives a name to the backup task. Click 'Next' to continue. The window as in the below screen shot opens. Set a password to the backup file and provide the 'Mail Notification' details, if required. The software asks you to give the Consolidation value. If you give 25 as the consolidation value, the backup will be executed automatically for 25 times, with your defined settings. At the end of the 25th time, it will club the backup files into one. Similarly, you can check mark the 'Image Validation' option to validate the backup image upon its creation. Click 'Next' to continue. The window opens for setting the scheduling options. Check mark the option 'Schedule Now' or 'Schedule Later', according to your requirement. Click 'Next' to continue. Another window opens as in the below screen shot. Set the Date, Time and the frequency of the selected backup task. Click 'Next' to continue. Below window opens. Provide the backup Type and Compression Level of the backup. Click 'Next' to continue. The Summary Window opens, which displays all the backup information regarding the current backup task. Click 'Process Now' to start taking the backup. The backup process starts. On successful completion of the process, a message box displays with the message – 'Backup Successfully Completed'. Click 'OK' to close. As a technician consultant, Stellar Mail Backup has becomes my first thought now. Favorite part is the wide support with Microsoft email clients like MS Outlook, Windows Live Mail and Outlook Express. Great software, thank you for producing a trustworthy and stable product!